What is a dino bouncer? Follow children’s yelps of delight, and they’ll lead to a giant inflatable bouncer. These room-sized inflatables are a combination of a ride, game, playroom, and trampoline. 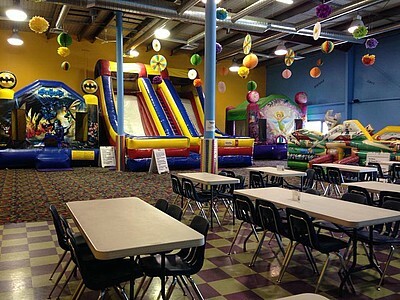 Dino Bouncers is the first indoor inflatable jump center unique to Regina, SK, Canada and is ready to entertain people of all ages! Located at : 1305 Park Street, corner of 7th ave and Park!!! While exciting new activities will ensure our new location is the place to be, we can also come to your great events with a dino bouncer rental! BIG HIT birthday parties, FANTASTIC family reunions, BOUNCING block parties, AWESOME aftergrads, FABULOUS fundraisers, DELIGHTFUL daycares, TOTALLY cool tournaments, COMPLIMENTS galore company affairs and COOL customer appreciation days. We have also attended WONDERFUL wedding gift openings, BOISTEROUS baptisms and CHARMING church picnics. Don't forget our CHEERFUL Christmas parties.